The Zavio CamGraba surveillance NVR software is capable of being accessed remotely using an Internet Explorer web browser. The web interface shares the same controls as the CamGraba main console live viewer interface. 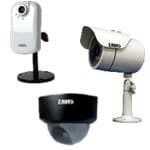 This allows users to view their Zavio IP cameras remotely from anywhere. The Instructions below explain how to view the Zavio CamGraba surveillance NVR software remotely using an Internet Explorer web browser. 1. First, ensure that the correct ports are forwarded in the router attached to the Zavio CamGraba PC. Now ensure that the correct network settings are set up in the CamGraba main console. If you have not yet done this, please visit our Zavio CamGraba Network Setup article. 3. Choose Live Viewer. You will be prompted to enter the CamGraba's Username and Password. You will then be asked to download Active X Controls, go ahead and install them. 4. You should now have remote access to CamGraba.